MOSCOW, October 3. /TASS/. It is necessary to seek a pullout of all foreign forces from Syria, including Russia, in case this decision will be taken by Syria’s government, Russian President Vladimir Putin said on Wednesday at the Russian Energy Week plenary session. "We should pursue a goal that there would be no foreign forces, [the forces] of third states in Syria at all," Putin said. "Including Russia, if this would be adopted at the level of government of the Syrian Arab Republic," the Russian president added asked by the moderator if Russia was meant here. Russia is interested in stability in Syria. It is linked to how the situation affects the energy market as well as to international security and the war on terror, Putin added. 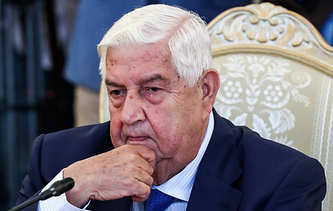 Russian-Turkish agreement on setting up a demilitarized zone in Syria’s Idlib Governorate is a "very good deal" that prevented further bloodshed and the sides are actively working on fulfilling it, he said. "This is a very good deal between Russia and Turkey in this case. That’s because it prevented further bloodshed," Putin told a plenary session of the Russian Energy Week forum in Moscow. At their meeting in Sochi on September 17, the Russian and Turkish Presidents, Vladimir Putin and Recep Tayyip Erdogan, agreed to establish a demilitarized zone in Syria’s Idlib along the contact line between government troops and the opposition by October 15. Military hardware should be withdrawn from there and the zone will be controlled by Russian and Turkish military patrols. "I want to note that now we are really actively working on implementing these agreements. Our Turkish partners are doing this as well. We register this and we see this, and we are thankful for that and we will be working with them further with the support of Iran, in this case," Putin said. Idlib is the only large Syrian region, which still remains under control of illegal armed groups. In 2017, a northern de-escalation zone was established in the region, where militants reluctant to lay down their arms and sign reconciliation deals with the authorities moved together with their families.